The Lifestyle Challenge is brought to you by BODZii, a Nutrition and Lifestyle service with a focus on food quality and building a healthy relationship with food. Our main goal remains the same: to introduce you to an individualized nutrition program that will support and promote active and healthy lifestyles. We truly believe that nutrition plays a critical role in your fitness, and proper nutrition can help amplify your training and overall lifestyle. The theoretical hierarchy that exists for the development of an athlete is the CrossFit pyramid, with nutrition being the base that supports this development. 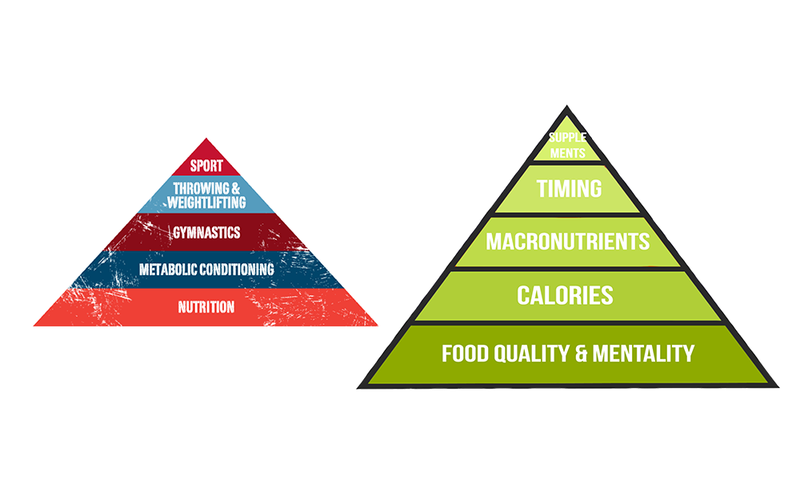 Building on the CrossFit pyramid is the Nutrition Pyramid which puts the main focus on Food Quality and Mentality. This is where we are going to be focusing. The challenge will focus on food quality and building a healthy relationship with food. In previous years, we’ve put the focus on food quantity without dialing in the quality first. The importance of viewing food as something more than just something tasty will lead us to creating a lifestyle that we can be in complete control over. Food is not only a social and very emotional thing but it’s also the fuel we need in order to perform and feel our best in every day life. This guide is jam packed full of information to help set you up for a lot of success over the next 4 weeks. There are certain protocols that should be taken before the challenge starts to ensure you get the desired results, but we’ll get into that later. Here is a breakdown of the challenge!